While on vacation my sister decided to teach us girls how to make fabric flowers while the men folk were on the golf course. I am sure many of you know how to do this already but I decided to photograph it anyway (just in case) because I found it quite addicting. In a way it reminds me of embossing powder...the way it doesn't do anything for a minute and then all of a sudden it's done. I love that part. As I said, I started the process on vacation but ended at home so please forgive all the different surfaces I photographed the flowers on. You will need a pair of sharp scissors, acetate fabric (lining fabric), small piece of felt, a hair clip, needle and thread, low temp glue gun, and a candle. You will need something to make circle patterns. I used chipboard but an old cereal box will do. You really can cut the circles any size. In fact, now that I have made a few I found I liked the large circles better than the small circles. So I eventually made a circle pattern 4" wide and stopped cutting out the 1 1/2". What you put in the center will determine if you need the 1 1/2" size. Cut 2 of each size circle so you end up with at least 10 fabric circles to work with. Don't worry if your circles are not perfect. Any perfections will be cured in the next step. Use a candle to burn the edges of the acetate (here's where the embossing powder theory comes in). Hold the fabric over the candle, the rising heat will melt the edges of the acetate. Use tweezers when melting the smaller circles so you don't burn your fingers! Once you have all your petals melted it will look like this. Now to finish it off here at home! With the base flower you can make many variations. For the first one I left the flower as it was. Using a needle and thread I stitched through all the layers to secure the petals in place. Then I cut the back off an old clip-on earring with my Tonic scissors. 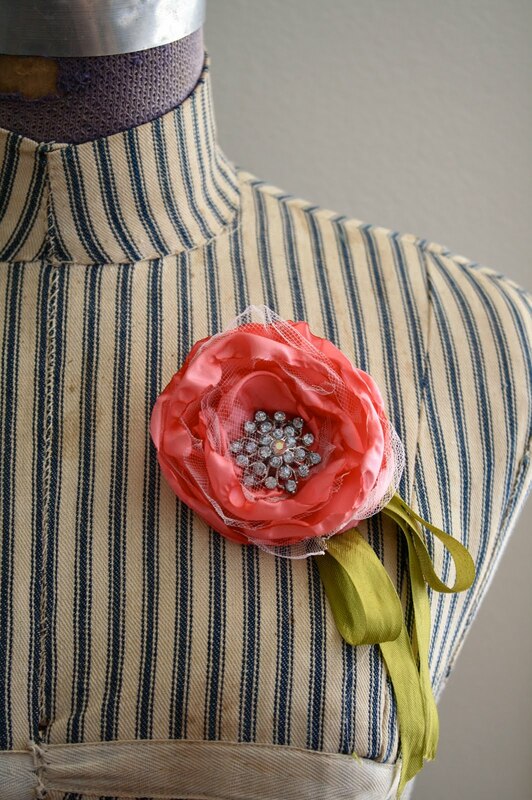 You can sew or glue the earring to the center of the flower. Note: If you don't have an old earring just sew a few beads into the center. Cut a piece of felt for the back. Clip a hair clip to the felt piece (I found mine at Michael's by the wedding section). Add a bit of glue from a low temp glue gun. Turn the flower over and add to the back. Same flower petals, but this time I added tulle. I cut tulle circles using the largest pattern only. I found that the tulle melts MUCH faster than the fabric. It also shrinks much more when it melts, hence cutting larger size circles. You definitely have to hold the tulle farther away from the flame! All that being said, I love the look the tulle brings to the flower. Now for the center. My friend Mindy sent me these hair clip things she bought at a kiosk in her local mall. She liked them and figured I could re-purpose them in some way (of course I can). I have never seen anything like this locally. Apparently they are to be screwed into some kind of hair clip or head band for your baby. I figured it would work perfectly for the center. It did. I just cut a small hole, threaded the small screw through and added the nut. Perfect. I cut a piece of pea green seam binding. Tied a big loop bow and stitched it to the back. I repeated the same method to add the clip to the back. Fabulous tutorial! Now can I have that flower to wear in my hair for my wedding...it's a perfect match for the flower girls' dresses! :) Love this and think a little shopping trip is called for! So darling and I love your tutorial! I, too, like the touch that the tulle adds. I too have had so much fun making flowers like these! Beautiful! Oh my gosh... these are absolutely FABULOUS!!! I cannot wait to try. Your tutorial was great- thanks for stepping everything out like that. Wonderful! Thank you - thank you for sharing :) !! Super adorable. You do write the best tutorials ever. If we ever get the backyard finished I'll be trying to make a couple of these cuties. Paula, Love the flowers..but is so nice to see you mannequin...love it! On the off chance that you need to have more space for unused greenery enclosure instruments and other gear, it is imperative to choose which garden building you need in your greenhouse region.